Railway Minister Nitish Kumar today unveiled an Interim Rail Budget laced with politically-correct announcements in this election year, consumer-friendly sops, launching of 18 new non-stop fast trains, innovations to take on the challenges of the rapidly expanding road sector and mega schemes aimed at completing all pending projects worth Rs 43,000 crore within the next five years. Should a commission be set up to enquire into the functioning of lower judiciary in the country? A completely new category of trains, Sampark Kranti, will start plying between the national Capital and 18 states with new features aimed at reducing travel time without compromising on passenger comfort. Amid drum beating, the Government of West Punjab rolled out a red carpet for Capt Amarinder Singh, Chief Minister, when he crossed the Radcliff line here today. Mr Parvaij Elahi, Chief Minister, West Punjab, and his Cabinet colleagues were present on the other side of the border to accord a rousing welcome to the guests. 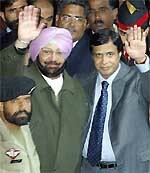 Punjab Chief Minister Amarinder Singh and the Chief Minister of Pakistani province of Punjab, Chaudhary Pervez Elahi, wave to the crowd at the Wagah border crossing on Friday. Though no case of bird flu has been reported from any part of the country, poultry farmers have been hit hard following such reports from across the border. The Chandigarh Police today claimed to have unravelled the conspiracy behind the January 22 escape of dreaded terrorist Jagtar Singh Hawara and three others from Burail jail here after arresting a former militant Narain Singh Chaura from Mohali. The cold intensified in northern India with heavy snowfall and rain in the upper reaches of the Himalayas, which triggered landslides resulting in the closure of the Jammu-Srinagar highway and the Hindustan-Tibet Road in Himachal Pradesh today. The child appears to be plucking “snow in bloom” in a flower bed in Shimla on Friday.